The DJ Fog Smoke Machine is a powerful new fogger with an outboard fog switch which is ideal for any "medium-duty" application. Button-activated fog means you can control the amount of fog in your party room. Creates a safe, water-based fog. 1500w use the latest alnic pipe technique, heater not easy to jam. the fogger matches with remote controller/ Wire Controller. 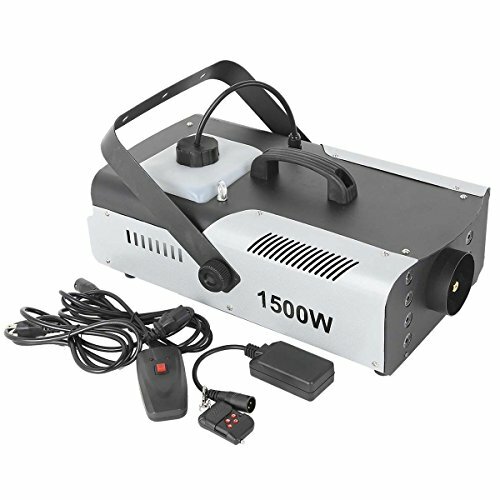 8 LEDs light up during operation and change the color automatic.This portable fog-master is great for bands, DJs, clubs or anyone else who wants a reliable affordable fogger.1500W Party Fog Machine! Simple to use - just fill machine with fog fluid, plug in to wall outlet and wait for the Ready Light. When the light is lit, push button for a burst of fog as needed. Creates a smoky atmosphere to enhance any light show. An LED-illuminated tank allows the fluid level to be seen from a distance, while its water-based components won't leave any residue.